There exists congruent morphological and molecular evidence that the Columbidae and Pteroclidae are sister taxa (Mayr and Clarke 2003; Cracraft et al. 2004; Ericson et al. 2006; Livezey and Zusi 2007). The closest extant relatives of the clade including these two taxa are, however, unknown. The Pteroclidae only occur in Africa and Eurasia, whereas the Columbidae are globally distributed. Stem group representatives of the Pteroclidae were found in the Quercy fissure fillings (Mourer-Chauvire 1992b, 1993). The specimens of the three species of Archaeoganga, A. larvatus (Milne-Edwards, 1892), A. validus (Milne-Edwards, 1892), and A. pinguis Mourer-Chauvire, 1992, lack stratigraphic data, whereas Leptoganga sepultus (Milne-Edwards, 1869) occurs in late Oligocene (MP 28) deposits. 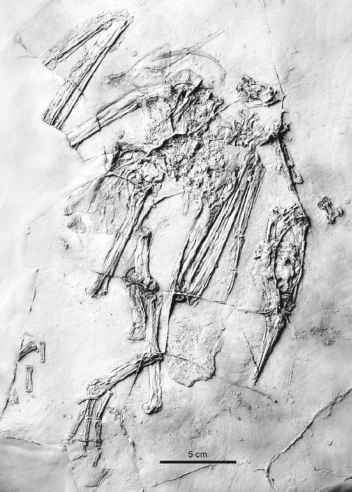 The Archaeoganga species are represented by humeri, coracoids, and tarsometatarsi, which closely resemble the corresponding bones of extant Pteroclidae (especially Pterocles spp., whereas the species of Syrrhaptes exhibit a more derived morphology). Of Leptoganga also an intertarsal sesamoid bone was described, whose presence is a derived feature of the Pteroclidae (Mourer-Chauvire 1993). Like their modern counterparts, these Paleogene Pteroclidae lived in an open and arid habitat (Mourer-Chauvire 1993). Whereas A. larvatus was the size of the extant Black-bellied Sandgrouse (Pterocles orientalis), A. pinguis was about twice as large and thus distinctly exceeded any extant species of Pteroclidae in size. Feduccia (1999, p. 225) erroneously stated that this species was 3 times larger than the largest extant sandgrouse, as Mourer-Chauvire's (1992b) comments pertained to its weight and not size. (Olson 1989). There is no published Paleogene fossil record, but Boles (2001b) noted the presence of Columbidae in the late Oligocene Etadunna Formation in Australia. The earliest named species is from the early Miocene of Florida and was classified into the extant taxon Columbina (Becker and Brodkorb 1992). The alleged columbiform Microena goodwini Harrison and Walker, 1977 from the early Eocene London Clay is based on a tarsometatarsus, which lacks the trochlea for the fourth toe. Without additional material, the affinities of this species are indeterminable, but I consider affinities to some of the "Coraciiformes" or a position within the "Caprimulgiformes"/Apodiformes clade most likely.